Canes baseball finished off the weekend sweep against No. 24 Virginia, defeating the Cavaliers 8-1 on Sunday, March 25, at Mark Light Field. The win marks Miami’s first sweep of the season and first of UVA since 2008. Led by junior pitcher Andrew Cabezas, UM (12-11, 6-3 ACC) is back over .500 for the first time since starting the season 2-1. Cabezas (2-2), who started the season as a closer and moved into the starting rotation March 18 against Duke, pitched six quality innings. He allowed just one run on three hits while striking out a season-high eight batters. The Miami Gardens native reached a season-high 90 pitches. In his past two starts for the Hurricanes, he has a 0.75 ERA. Emerging freshman Isaac Quiñones got the Hurricanes going early with a two-RBI double in the first inning. The hit brought in seniors Hunter Tackett from third base and Michael Burns, who beat out the throw to home. The play extended Quiñones’ hitting streak to 14 games and his multi-hit streak to three games. He leads the Canes with a .392 batting average. The freshman from Pembroke Pines has shown great patience at the plate. The early runs kept coming for Miami, and Virginia’s (10-13, 3-6 ACC) defense did not have an answer all day. 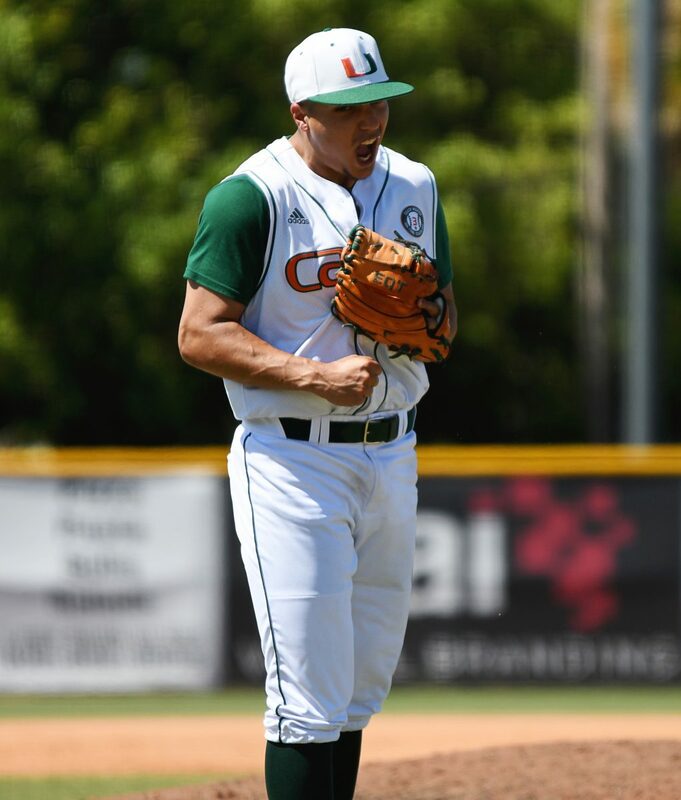 Seven of nine UM starters had a hit, including freshman Freddy Zamora, who recorded two hits along with Quiñones. The Hurricanes, who have struggled to maintain leads in previous games this season, effectively closed out the Cavaliers each time they threatened to score a run. With Miami leading 4-1 in the top of the eighth inning, Virginia had two runners on base with just one out. Redshirt senior Cooper Hammond halted the Cavaliers’ momentum, striking out the first batter and then forcing the next into a groundout to get out of the inning unscathed. Hammond earned his third save of the season with his performance out of the bullpen. The Canes put the finishing touches on the afternoon with a four-run bottom of the eighth inning. After watching Miami blow a lead to FAU earlier in the week, Cabezas said the sweep showed him a lot about the team. The Hurricanes will play an exhibition game against the Miami Marlins as part of their spring training schedule 3:05 p.m. March 27. The Canes will then take on Florida Gulf Coast University 6:30 p.m. March 28 in Fort Meyers.